You have several options if you want to improve your softball pitching speed. Strengthening your body is one obvious method, but improving your pitching mechanics can be equally as effective. Better still, perform a variety of drills to fine-tune your delivery while you build your arms and legs and put some extra zip on your fastball. If you have striding problems, it’s possible that you’ll find your body slipping backward a bit when you release the ball. Perform a “back knee forward” drill to help you keep your momentum moving toward the plate. Go through your delivery slowly but focus on moving your back knee forward to touch your front knee as you release the ball. When you deliver the pitch, you should be in a fairly erect posture with your weight shifted forward onto your plant leg. Leaning forward as you stride toward the plate helps you shift your weight aggressively and puts more power into your delivery. The sprint drill helps you understand how to align your body to produce the maximum weight shift. Stand facing a teammate, have her put her hands on your shoulders and then try to sprint forward for 10 feet. Repeat the drill but focus on your body position. To push your teammate and move ahead, you should lean forward naturally. Next, go to the mound and have your teammate put her hands on your shoulders again, but this time go through your pitching motion slowly. Your body position at the release point should be about the same as it was when you were trying to sprint against your teammate’s resistance. To help build your arm strength, stand on the pitching rubber and take three strides toward second base. 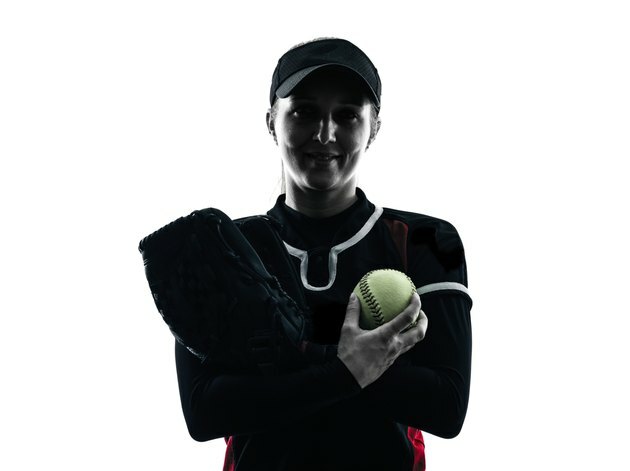 Turn around and throw three pitches to your catcher in her normal position behind the plate. Take three more strides away from the mound and make three more pitches. Continue the pattern until your pitches don’t reach the catcher in the air. Throw 15 to 20 pitches from your maximum distance, trying to hit various points in the strike zone. Reverse the drill and stop after you’ve thrown three pitches from the rubber. Throwing a basketball -- which is obviously larger and heavier -- can help enhance your pitching power. Stand about 25 feet from the plate and toss the ball underhand to a teammate in the normal catcher’s spot. Don’t use your regular windmill delivery. Instead, take your arm back and then step forward into your “pitch.” When you’re comfortable throwing from 25 feet, back up a few steps. Work your way up to pitching the basketball from the mound as fast as possible.